One of important goals of any application development process is making data presentation richer. ASP.NET 2.0 provides many server controls which render data in different rich formats and styles. For example, DataGrid control is suitable in many scenarios where you wish to display data in a grid like representation for easy understanding. Similarly, if the situation demands for rendering list like data, you can consider using of DataLists and Repeater server controls. Repeater control is a container control which is template based with no basic rendering of its own. This way, you define layout for the Repeater control by creating different templates based on your needs. You can create different kinds of lists using Repeater control including Table, Comma-separated list and XML formatted list. 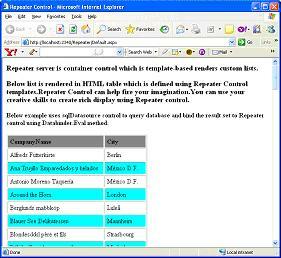 Repeater controls provides different kinds of templates which helps in determining the layout of control's content. Templates generate markup which determine final layout of content. AlternatingItemTemplate: AlternatingItemTemplates define the markup for each Item but for AlternatingItems in DataSource collection like different background color and styles. Like any other Data Bound control, Repeater control supports DataSource property which allows you to bind any valid DataSource like sqlDataSource, XML file or any datasets which implements ICollection, IEnumerable or IListSource Interfaces. The data in DataSource is bound to Repeater using its DataBind Method. Once the data is bound, the format of each data item is defined by a template like ItemTemplate. Add any Data Source control to the page such as sqlDataSource or AccessDataSource. Configure Data Source control such that you specify connection information and perform query. Drag and Drop Repeater control from Data section of the Toolbox onto the page. Set the DataSourceID property of Repeater Control to newly configured sqlDataSource control as shown above. Add an <ItemTemplate> element into the page as a child of the Repeater control. The Repeater control must contain at least an ItemTemplate that in turn contains data-bound controls in order for the control to render at run time. Bind the child controls to data from the query using the Eval data-binding function. Following example shows how to use Repeater control to display data in a HTML table. It will render the contents of the "CompanyName" field for each row in the DataSource Collection. You can download sample Repeater Control project, used with this tutorial.